A remeberance page for Alec Mounkes, 13, Lyndon, has been set up on Facebook - visit it at R.I.P Alec Mounkes. KANSAS CITY, Mo. — Alec Mounkes, a 13-year-old seventh-grader from Lyndon, died Thursday at Children’s Mercy Hospital in Kansas City, Mo., following complications from blood clots and infection, said Lyndon USD 421 Superintendent Brian Spencer. 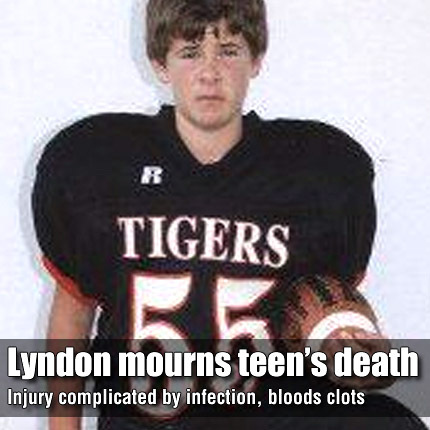 “On his 13th birthday, Oct. 6, Alec suffered a sprained ankle in a middle school football game,” Spencer wrote in a press release issued to area media Monday. Spencer said that five days after the initial injury, a trainer from Kansas Orthopedics who visits the school each week, made a determination that Alec needed immediate medical attention. He was transported by ambulance to Stormont-Vail in Topeka, where he went into cardiac arrest shortly after arriving. Spencer said the source of the problem was blood clots, and the blockage was so severe in Alec’s right leg, surgeons had to amputate his right leg at the knee Oct. 15. Spencer dismissed school at 12:05 p.m. Tuesday to allow students and staff to attend Alec’s funeral at 1 p.m. at Mt. Pleasant Community Church, Lyndon. Grief counseling has been made available to all students. Memorial funds have been established and will all be directed to the family. Lyndon State Bank, 817 Topeka Ave., has established the “Team Alec Account,” and Citizens State Bank, 1400 Topeka Ave., has established an Alec Mounkes Memorial Fund. Cards, flowers and memorial funds may also be sent to Feltner Funeral Home, 818 Topeka, Ave., Lyndon KS, 66451. • An obituary for Alec Mounkes appears on Page 2A of this edition.